Abstract: The Homolka granite stock (southern Bohemia, Czech Republic) is a highly evolved topaz-bearing and phosphorus-rich intrusion penetrating the Lasenice and Cimer S-type granites of the late-Variscan South-Bohemiam (Moldanubian) pluton, subvolcanic dykes of microgranite to granite porphyries are also widespread. Study of accessory zircon revealed an extensive amount of old inherited zircon in the Homolka granites. On the basis of back-scattered electron images and microprobe study, the inherited zircon of the Homolka Granite is identical to the zircon from the Lasenice and Cimer granites. This older zircon forms transparent crystals with oscillatory zoning and low Hf, Y, U and P contents. Younger zircon of the highly evolved Homolka Granite exhibits transparent crystals with oscillatory to irregular zoning and metamict grains with high Hf (up to 12.3 wt. % HfO2), often also Y, U and P. If 30 to 50 vol. % of zircon is estimated to be inherited, the calculation of zircon saturation temperature gives TS = 720–760 °C for the Cimer and 640–680 °C for the Lasenice zircon, and 610–650 °C for the Homolka zircon. The subvolcanic microgranite-porphyry dyke gave TS = 690–730 °C. These zircon data indicate that the Homolka Granite is a product of advanced fractional crystallization from a magmatic source similar to the Cimer Member of the Eisgarn Suite. Abstract: The complete breakdown of monazite was observed in metagranites of the Veporic Superunit while only slight alteration of monazite occurs in unmetamorphosed Tatric granitoids (Tribec Mts., Mala Fatra and Strazovske vrchy Mts.). Monazite breakdown is probably a result of the reaction monazite+annite+anorthite+quartz+fluids giving apatite+allanite+muscovite. During monazite breakdown its margins are replaced outward by apatite corona, allanite rim and REE-rich epidote. In extreme cases monazite cores are fully consumed by apatite which occupies the place of the former monazite. The result of such breakdown is grains with apatite cores and the allanite-REE epidote rims. The monazite breakdown in the Veporic Superunit occured under conditions of amphibolite facies during an Alpine metamorphic event, although the process of breakdown had probably already started during the Variscan metamorphosis. In the case of monazite from Tatric granites initial breakdown of monazite was found in the context of Variscan subsolidus granite alteration. Only restricted mobility of the REE is supposed during the breakdown of monazite. Abstract: This paper describes the petrological and mineralogical features of the quartz-muscovite metasandstones (QMM), a lithology found in the form of tectonic slices in an augen-gneissic environment N and W of Jasenie, Nizke Tatry Mts., Western Carpathians. These rocks have an exemplary psammitic texture, and are composed of detritic phases, represented by oval quartz grains, large muscovite flakes ans sparse individual grains of albite and metamorphic phases consisting mainly of quartz and microcrystalline aggregate of muscovite-phengitic mica. Small amounts of tine, metamorphic, newly formed albite and needle-like tourmaline are accompanied by scattered scales of chlorite and crystals of magnetite. Neither the QMM nor the associated siderite-ankerite metasandstones and phyllites (SAMP) contain biotite indicating that their metamorphic degree did not reach the biotite subzone. The total content of alkalies in the metamorphic muscovite-phengites is fairly high (>0.86 per formula unit), thus, they should be illite-free and their estimated degree of metamorphism should correspond to the epizone. This estimate is also supported by the incomplete compositional and grain size equalization between clastogenic and metamorphic white potash micas at their contacts. In contrast, the metamorphic white micas are considerably enriched in the phengite molecule. The X-ray and selected area electron diffraction (SAD) analyses made to visualize and to measure the crystallinity of individual carbonaceous matter (CM) particles revealed that most samples are composed of a mixture of anthracitic and graphitic carbon. While the anthracite is an indicator of very low metamorphism, the graphite first forms under greenschist facies conditions. A search for non-graphitizing carbons, such as shungite, skeleton crystals, or fullerenes, which form under medium or high-grade metamorphism, has been unsuccessful. Thus, all the ill-ordered carbons in the samples developed under low-grade metamorphism. This conclusion supports the authors’ earlier view that the rocks under study are metasediments and not diaphthorites. Abstract: The carriers of magnetic properties of rocks were studied using: (1) fully automated measurements of magnetic susceptibility (κ) change of sample influenced by temperature in the range of -196 to 700 °C, (2) reflected light microscopy, (3) electron microprobe analysis, (4) Mössbauer spectroscopy, (5) X-ray powder diffraction analysis. The carriers of magnetic properties of the neogene volcanics have been grouped into seven dominant groups (B, C, D, F, G, I, J) on the basis of the results of method (1) for about 670 individual samples. Groups B–F contain titanomagnetites (Tms) of two magnetic phases of different Curie temperatures (TC1 ,TC2); Groups B, C: first phase (TC1 ≈ 130–220 °C) contains quasi homogeneous or partly oxidized Tms of composition Fe2.35Ti0.65O4-Fe2.5Ti0.5O4, second phase (TC2 ≈ 570–575 °C) contains oxidized Tms of unknown composition. Groups D, F: both magnetic phases correspond to oxidized Tms of unknown composition. Group D — dominant phase of TC1 ≈ 480 °C and second magnetic phase of TC2 ≈ 590 °C. Group F contains oxidized Tms, a first magnetic phase of TC1 ≈ 420 °C and TC1 ≈ 530 °C, and a second one of TC2 ≈ 600 °C, TC2 ≈ 590–600 °C. magnetic phases of TC ≤ 585 °C also contain small portion of hematite-ilmenites. Group G contains one magnetic phase of TC ≈ 580 °C (and Verwey transition temperature of TV ≈ -153 °C), which corresponds tu pure multidomian magnetite. Group I contains two magnetic phases, a first phase of TC1 ≈ 560–600 °C corresponds to nonstoichiometric magnetite (exceptionally an oxidized TM can be present), and a second phase of TC2 ≈ 600–630 °C corresponding to hematite-ilmenites. The J group contains only one phase of TC ≈ 610–640 °C. This magnetic phase corresponds to hematite-ilmenites. The magnetic phases of TC ≈ 585–640 °C correspond to hematite-ilmenites, probably of composition within the range x ≈ 0.09–0.04 (of equation Fe2-xTixO3). Dominant occurrences of the groups B–J have been delineated in the geological schemes. Abstract: Foreword: The 6th scientific meeting “New Trends in Geomagnetism“ follows the previous five meetings, focused on the recent progress in paleomagnetism, rock magnetism and environmental magnetism, held in 1988 in Liblice, in 1990 at Bechyne, in 1992 at Smolenice, in 1994 at Trest and in 1996 at Topolcianky. This jubilee biennal meeting was organized jointly by the Academies of Sciences of the Czech and Slovak Republics and held at the beautiful Czech castle of Hruba Skala. The meeting is traditionally a suitable place for informal discussions and exchange of the latest knowledge among scientists from many European and extra European countries. 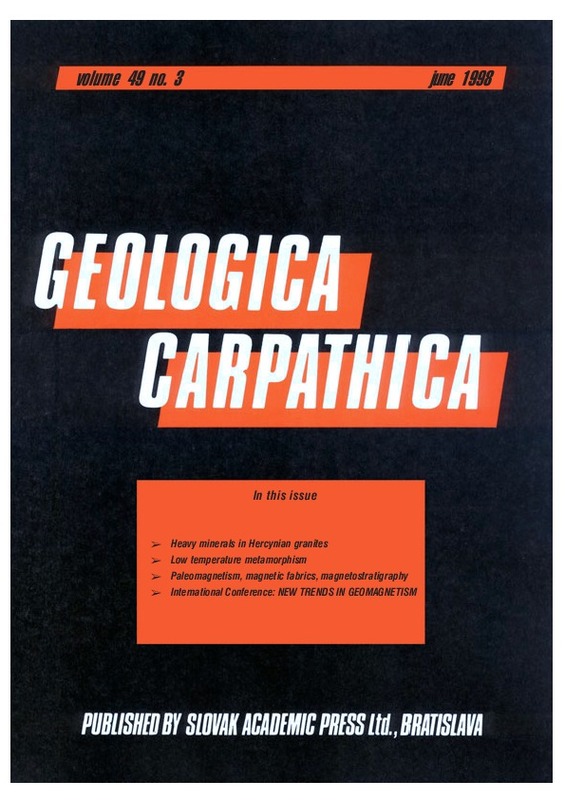 The general topics are: paleomagnetism and tectonics, archeomagnetism, assessment of quality of the paleomagnetic and rock-magnetic data, general rock magnetism and its physical backround, magnetostratigraphy, environmental magnetism, relations between paleomagnetism and global changes as well as new techniques and approaches.